The arraignment for a former San Francisco 49ers player accused of attacking a 70-year-old hotel guest has been postponed to November 2. 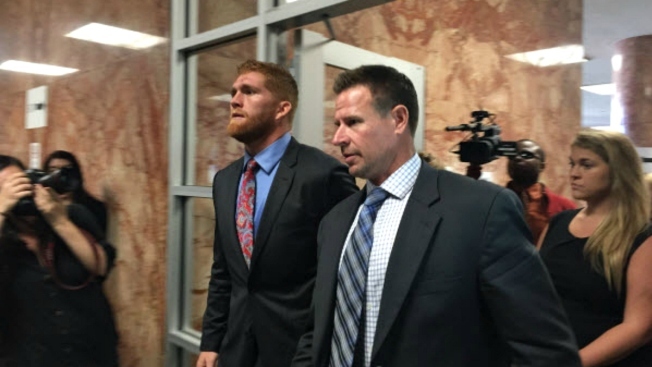 Bruce Miller, who recently played tight end for the 49ers, appeared briefly in San Francisco Superior Court on Friday, where a protective order was issued. The order means Miller must stay away from the people he is accused of hurting. "I'm not at liberty to talk about this because there's an investigation going on," Miller said when he entered the courthouse on Friday. 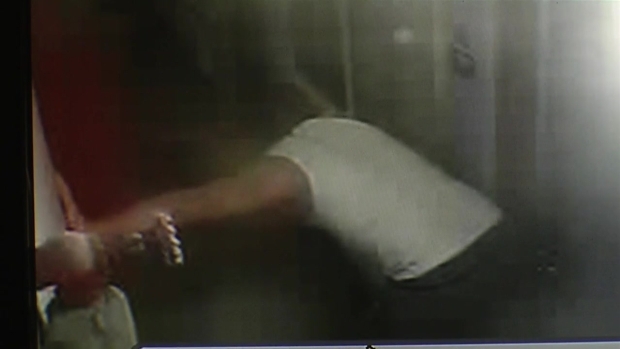 Surveillance cameras at the Travelodge in San Francisco capture a disoriented Bruce Miller before his arrest on assault charges. The San Francisco District Attorney's Office on Thursday charged Miller with seven felonies stemming from an attack on a 70-year-old man and his son, including assault with a deadly weapon - the weapon being a cane. "They were punched. There are significant injuries to both of them," San Francisco District Attorney George Gascon said. "Unfortunately, it occurred by somebody who our young people and the community are looking up to, somebody who belonged to a major sporting organization in the area -- so it is embarrassing." The remaining charges, according to District Attorney spokesman Max Szabo, include: one count of assault with force likely to cause great bodily injury, one count of inflicting injury on an elder, one count of battery with serious bodily injury, two counts of assault with force likely to cause great bodily injury, and one count of battery. The last count is a misdemeanor. The others are felonies. Several of the charges carry elder abuse enhancements, Szabo said. The older man suffered a black eye and possible facial bone fractures, according to San Francisco General Hospital. He was discharged earlier this week. Miller declined to comment to reporters after he posted bail on Monday, hours after police arrested him for allegedly punching a 70-year-old hotel guest, and his 29-year-old son at the Fisherman's Wharf Marriott earlier that day. He was found vomiting and bleeding across the street from the Marriott at the Travelodge, where a manager there called 911 and provided some surveillance video of the arrest. His Atlanta-based agent, John Reale, told NBC Bay Area earlier this week, though, that Miller was a "great guy" and he was flabbergasted to hear about the alleged attack. His attorney, Josh Bentley, did not immediately return a call Thursday seeking comment. The 49ers released Miller from the team on Monday. NBC Bay Area's Gonzalo Rojas, Mark Matthews and Kristofer Noceda contributed to this report.